Plans to introduce two new bus gates within Glasgow city centre have opened for consultation. The proposals are intended to improve journey times and reliability on key bus routes close to Central Station, which can carry up to 360 buses every hour at peak times. The two gates - one at Union Street for southbound traffic and the other at Oswald Street for vehicles heading north - will both give access to buses, taxis, private hire vehicles and cycles. They will also allow access for goods and service vehicles. 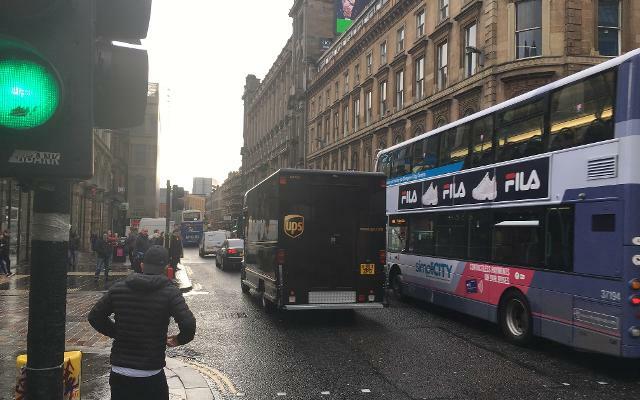 Originally proposed in the 2014 City Centre Transport Strategy, the bus gates will cut the number of vehicles and delays on these roads between 7am and 7pm each day, which in turn will reduce emissions in one of the busiest pedestrian areas in the city centre. A reduction in emissions is a key policy objective for the council as around 300 people die every year in the city as a consequence of poor air quality. Less traffic will also reduce the accident risk for pedestrians while still giving scope for deliveries to city centre businesses to be maintained. Councillor Anna Richardson, City Convener for Sustainability and Carbon Reduction, welcomed the publication of the proposals for the bus gates as a key part of the council's efforts to support the city's bus operators and promote the use of public transport. Councillor Richardson said: "The bus is still easily the most popular form of public transport in Glasgow, but passenger numbers are falling at a very steady rate and the bus industry is under real pressure. "As a council, we have to do everything that we can to sustain public transport in a city where almost half of our population have no access to a car. Not supporting the bus sector will have long term, negative consequences for a huge swathe of Glasgow's population and the city's economy as a whole. "One of the main issues for the bus operators and their passengers is the reliability of the service. By providing clear channels for buses to use, we can reduce delays and get closer to the target of 'on time every time'. The bus routes either side of Central Station are two of the busiest in the city and the introduction of bus gates will see significant improvements to the service on these streets. The proposal is for bus gates to restrict access on Oswald Street between Midland Street and Argyle Street with restricted access on Union Street to be between Gordon Street and Argyle Street. As part of the proposal, the number of disabled parking bays on West Nile Street will be increased to account for the loss of access to Union Street. Alternative routes using Wellington Street and Robertson Street for southbound vehicles and York Street and West Campbell Street for northbound vehicles are being proposed at this stage. The introduction of the bus gates would support the Glasgow City Centre Low Emission Zone, Glasgow's City Centre Strategy and City Centre Transport Strategy.